My 6 month old Rottweiler puppy has swelling in his eyeball. It came on 3 times in the past 2 months and each time, it happened when he was playing in grass and fields. Same spot, same eye, not much redness, just swelling. Also, it goes away after 2-4 hours or so. Could it be an allergy or a more serious eye infection/disease? 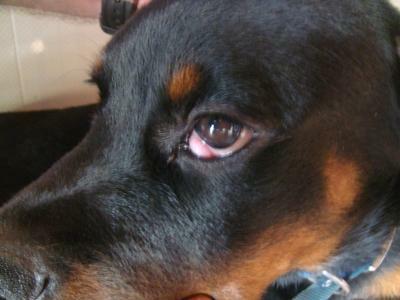 It looks like your Rottweiler has a problem called dog cherry eye. There is a gland on the third eyelid of dogs that is supposed to stay tucked away out of sight, but if the ligaments that hold it in place are weak the gland can pop out of place. It may pop back for a while, but I’d bet that with time it will come out and stay out. If that does occur, have your vet take a look to be sure that is what you are dealing with. The best way to treat dog cherry eye is with a surgery that involves cutting a flap in the mucous membrane covering the third eyelid, tucking the gland underneath, and then suturing everything in place. Keep in mind that there is a good chance that your Rottie could develop a canine cherry eye on his other eye at some point in the future too.